Replaced by the new Mario Odyssey content? 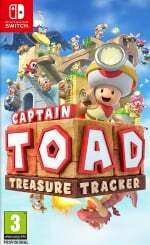 Captain Toad: Treasure Tracker is steadily getting closer and closer to release on Switch and 3DS, but there appears to be one very strange omission from the original Wii U release. In a hands-on preview of the game, the folks over at NintendoWorldReport have mentioned that the four Super Mario 3D World-inspired levels present in the original game have been replaced with four levels featuring different Super Mario Odyssey Kingdoms. We've known about the new Super Mario Odyssey-inspired content for a while now, but it was assumed that this would be an addition to the main game - not something to replace already existing levels. Of course, it would make sense for Nintendo to put any nods to Super Mario Odyssey front and centre in the new release, hoping to generate more sales across the two games thanks to the crossover, but getting rid of content referencing another game seems like a very odd decision. Hopefully the levels are still present in some way later in the game - perhaps as unlockable content. We'll have to wait and see when the final game arrives next month. If you want to get a taste of Captain Toad before it releases on 13th July, make sure to download the free demo that has become available on the eShop today. Time to complain... should we tweet Sakurai? Another Wii U port. Pass. This is ridiculous. There is no reason for them to be removed, and it’s annoying how little new content Nintendo is putting into these ports. Development time would be much better spent on a new game instead of a rerelease if there isn’t anything substantial that’s added. I hope that’s not true! I’m all for Wii U ports (and have them all so far), but the half arsed approach from Nintendo is getting old pretty quickly. After a stellar 2017, I’d hate to see Nintendo drop the ball with Switch. Because right now if feels like they’re kinda fumbling it. Why not include both SM3DW and Odyssey content, especially if you consider that it's getting a 3DS release several years after the Wii U one, and yet it will probably cost the same as a "regular full-price game"? Nintendo seems to be losing its touch more and more. Wait this is coming to Switch too?!?! Goodness the port situation is real. Also, there's only four new Mario Odyssey levels in the game, which Gamexplain says can all be beaten within ten minutes. I would have preferred that Nintendo take their time and flesh those new levels out into a full new game rather than shoehorn them into this port, while removing levels that were in the original. It's the very definition of underwhelming. @Nightwalker It actually doesn't cost the same as "a full price regular game". It's £35 on both 3DS and Switch, same as it was at launch on Wii U. Then again, all we did as consumers was tell them the Wii U wasn't good enough, so removing references to a game not likely to be ported on a system consumers made clear they want to forget is a logical step. Another Wii U port... playable anytime, anywhere, with anyone. Awesome, can't wait to check them out! In the original you had to have a 3D World save or complete the main levels to unlock the 3D World levels. So most likely they are still there as unlockables. Still don't see why people complain so much about the existence of wii u ports. 2 people have already chimed in about it in only 6 comments. And it's waaaay worse in forums and reddit. I don't really understand the logic. A lot of people didn't buy the wii u, so why wouldn't they port over a lot of the best wii u games? It's not like you have to buy them. Is it because people think that this detracts somehow from them making new games? In all the years of xbox and ps consoles I've never seen as much complaining when they do ports as I do now with the switch. Also would people rather not have any ports? I'm honestly confused about the whole matter. 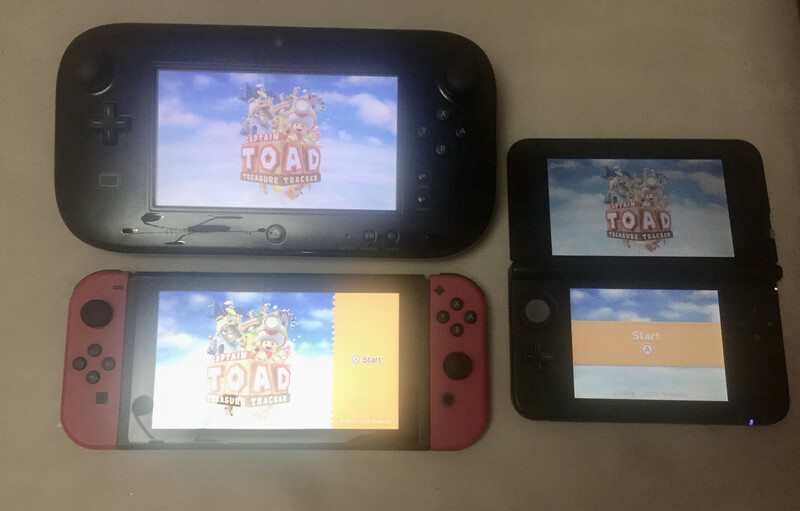 For the ones unhappy with the amount of ports coming to switch, where is a happy medium for you? So is it new content or just replacement content of then!? It's a shame anyway....does this mean SM3DW isn't coming to Switch? If the Wii U had all these great games the Switch is getting maybe it would have sold better. So this is a Port after all, despite leading into the events of SMO afterwards. It would make sense to not include the SM3DW levels as they in the Wii U game only were playable to those who had SM3DW save data. Atleast they’re doing something to acknowledge the fact of how Captain Toad was in SMO, though they only went with 4 Kingdoms to explore. "In the original you had to have a 3D World save or complete the main levels to unlock the 3D World levels. So most likely they are still there as unlockables"
Anyone else want to confirm this? @Joker13z it's because a majority of Nintendo published games are just Wii U ports. No one complained when they ported Wind Waker or TP to Wii U because it wasn't like every other game Nintendo published was a port. On Switch Nintendo has published more Wii U games than original Switch games. If you don't believe it look up the Wikipedia page on Switch games published by Nintendo. I want Super Mario 3D World on Switch! More Wii U ports = Better. Why should we complain for such a thing like that ? Not everyone owned Wii U, so it will be a Big Opportunity for them to try Wii U port games on Switch. Beside, you CAN'T play Wii U on the go. Cool all the more reason to keep both versions. Probably because those levels end with a message along the lines of "the adventure continues in Super Mario 3D World"
I am thankful that many of my favorite Wii U games are now going to be much more portable. So you make an article saying they took the levels out but then in the article you admit that you really don’t know if they’ve been taken out? What’s the point of this article exactly? @Joker13z I wantz all the ports. Especially all the Wii U Mario games - ALL OFF THEM. If its a good Wii U game - bring it to switch. @Joker13z there are more ports than original first party Switch games. That's a problem. Also PS4 and Xbox One ports are priced lower. Tropical Freeze costs MORE than what it did on Wii U. That's a problem. @Cheez It's not that I don't believe you. That is interesting info. But my question still stands that do you or others think that Nintendo would have put out a bunch more games if the ports weren't there? For instance, were they putting out more games in a shorter period of time for other consoles for like the Wii U that weren't ports in the first year? Considering that Captain Toad: Treasure Tracker is a prequel to Super Mario 3D World, I believe a port of the latter is an inevitability (unless Nintendo have retconned the ending). I'm disappointed that the amiibo variations of the stages aren't present in the demo. It's like Nintendo don't even want to sell these things anymore. @Joker13z May possibly be due to people not feeling that there haven’t been enough worthwhile games coming out of Nintendo for year 2 of the switch. Honestly don’t think people would comment on it if they felt they had gotten enough from Nintendo. It personally doesn’t bother me as they are great games. The argument on whether or not Nintendo has forfilled expectations in the second year is another argument. Well, I've been trying to sell my copy of Captain Toad Treasure Tracker for Wii U (normal cover, not ugly Selects), unsealed but used only one hour or so. Unsuccessful by the time being. I wanted to reinvest the money on Switch version, considering I haven't really played it, but... if the difference is only 4 levels and the game is anyway missing others... then I won't cry too much if I can't sell it before the new version launches. It appears I won't achieve it, no interest from people by now. Worst case scenario, it would give me a new excuse to give some love to my on the other hand pretty much abandoned Wii U. @marnelljm No reason to get snappy and just keep saying that's a problem like I didn't read you saying "that's a problem" the first time. I'm trying to have a polite discussion over here. As for the price issue. I agree that was a problem with Tropical Freeze. I didn't like that either. Was that just an outlier or did they do that to more of them? I don't really keep up with price comparisons. Nintendo being Nintendo. Odd choices left and right. @Mr_Pepperami Thanks for the input. I'm happy with their stream of content and third party content so far. I also didn't play many of these Wii U games so the ports don't bother me as much I guess. Guess we'll see how it continues the rest of this year and going into next but I've got a lot of stuff preordered right now being a mix of first and third party so if the trend continues I'll still be happy. And they have to run out of Wii U games that sold well at some point anyways haha. I was hoping this wouldn't be a straight port. I loved the original but not sure it warrants a double dip. @Joker13z all the Wii u games being ported are well worth playing as they are excellent titles. If you’ve not played them then pretty much all of them are worth a buy to be honest. I think the year hasn’t been totally terrible otherwise but not brilliant. Kirby was ok, mario tennis seems to be ok but I personally won’t get it unless they sort that online out as it has real problems, smash and Pokémon look good but I feel they were one or two titles away from having a very good year. In contrast 2019 now looks great potentially. I really had zero intention of ever checking out Captain Toad to begin with, if only because I hated those levels in 3D World, but nice to know they're giving extra incentives not to do so. @Mr_Pepperami Hmm yeah I hear you there. I played better Kirby games and I'm mainly getting tennis for get togethers and such. Just like Mario Party coming later this year. I seem to be one of the few excited about that game haha. I guess I've just been content with the ports since I've not played a good amount of them and all the third party content out and coming out has really satisfied me. Cause of that I'm not really noticing the lack of new first party stuff probably. I'm definitely really pumped for Smash though and not as pumped but excited for the new Pokemon game. Seeing as the stages were made available in the Wii U version if you had save data for 3D World, something makes me wonder if a 3D World Switch port is incoming and will function the same way with the Switch version of Captain Toad in the future. I’ll be honest - I was never really going to buy this until it was dirt cheap used anyway. @gatorboi352 How dare they release games for their system! @Anti-Matter Beside you CAN play a Wii U anywhere. And although I agree ports are good for the non-Wii U owners, what about the rest of us? You expect us to buy them twice? Gonna be honest I legit cannot tell if you're being facetious or not. Watched a YouTuber play the demo and though I've played it on the WiiU it made me excited for it. I'm a buyer at $40. If its full price I still got my WiiU hooked up so I'll just play it on there. Weird if Ninendo did take out the old Mario levels in this game. Why not just add? For someone who trolls the comments section every single chance, I'm surprised you didn't get the memo. I have some Wii U games that also Ported to Switch (Mario Kart 8 & LEGO CITY Undercover). I Double Dip those games because i knew they are Not Exactly same games. And for other gamers, if you don't want to buy them due to already owned Wii U version , just don't buy it. Nintendo or I didn't asked or forced Wii U owner to buy again the Switch version. It just an Optional offers. Just because the games released Two times in different machines, it Doesn't mean you have to buy them again. "...it was assumed that this would be an addition to the main game - not something to replace already existing levels." Funny. I had assumed the opposite. DK TF is one that if it was maybe $35 that would be fine, I would of even got it.... But not $60 for a game with literally nothing new. Mk8D passes because it has a proper battle mode, new characters, etc. And it was when the Switch was still so young. I know not a lot of people got the Wii U, but that doesn't mean you can price ports at $60 if they aren't either new games or a boat load of new content on it. Guess there will be no Super Mario 3D World port, then? But really, why would they remove levels? There is no reason for this to not be an addition. This information is based on information that has been commented on another website?, and that is not the full game? ; And still people react, as always, as if it were the end of the world?, Seriously?, SERIOUSLY?!! Even you can take Wii U on the go with Power Bank, but you will NEVER Able to play Wii U games that requires TWO Split screens to play if you take on the go. Say, can you even play Nintendoland, Earthlock, LEGO CITY Undercover, Mario & Sonic at Sochi 2014 on the go with just a Gamepad WITHOUT TV ? Play Nintendoland, LEGO CITY Undercover, Earthlock , Mario & Sonic at Sochi 2014 WITHOUT TV, just Gamepad Only. And tell me what did you see from your Gamepad ? Because i have EVER tested before. @LegendOfPokemon @RyanSilberman Some people who had WiiU version are saying those levels were pretty weak compared to the rest of the game - the 3d World levels weren't modified enough to fit this game. I have been completely fine with the WiiU ports so far... glad to have those games on Switch ASAP... but Captain Toad is one that should have definitely been a sequel with all new content. And maybe include the original to make it a $60 value. However you look at it, this can't be a straight port due to the levels that relied on the gamepad. The mine cart levels were the ones that forced you to pay more attention to the pad, since aiming your turnip shots kind of required it. I don't see any info still on how those would work now. Some kind of picture-in-picture maybe? It's a little discouraging that they removed the SM3DW levels. Not a great sign to those of us hoping that game gets a new lease on life with a Switch version. Such a shame that a Mario game that good is constantly swept under the rug of Wii U failure. It's really the best version of adding 3D to the classic Mario formula they ever did. All other 3D Marios are that different kind of "3D adventure" type where you have multiple "earn a star/moon" missions. SM3DW was just good old fashioned run-to-the-goal levels with just the right amount of 3D freedom. Ah well, destined to be an underappreciated footnote. Everything on GameCube, Wii and Wii U should come to Switch, I would rebuy all of them again whether ports or remastered: Zack and Wiki, Muramasa, Manhunt, Madworld, Super Mario Galaxy 1 & 2, Skyward Sword, GoldenEye 007 Remastered, Skies of Arcadia Legends, Soul Calibur 2 & Legends, Tales of Symphonia 1 & 2, Tekken Tag Tournament 2, Need For Speed: Most Wanted U, Tokyo Mirage Sessions #FE, Metroid Prime Trilogy, Sonic Colors and Unleashed, Sakura Wars: SLML, Fatal Frame 4 & 5, the Prince of Persia trilogy, Capcom vs. SNK 2, Tatsunoko vs.Capcom, Silent Hill: Shattered Memories, Tenchu: Shadow Assassin, Bloody Roar: Primal Fury, Ninja Gaiden 3: Razor's Edge, ZombiU, Rayman Origins, Elebits, ExciteBots, Resident Evil 1-4, Dead Rising, Dead Space Extraction, The Conduit 1 & 2, Sonic Adventure 1 & 2, Final Fantasy Crystal Chronicles, Arc Rise Fantasia, Geist, Baten Kaitos 1 & Origins, Mega Man X: Command Mission, Billy Hatcher and the Giant Egg, Gotcha Force, Eternal Darkness, etc. Perhaps they're planning a port of SM3DW as well and the stages will be unlocked that way? Correct me if I'm wrong, but doesn't the 3D World levels in Captain Toad require save data for Mario 3D World? If so, then the removal of those levels make sense, even if not ideal. Hope people won't buy all those lazy stuffs to send a strong message to Nintendo ! WE WANT SWITCH GAMES !!! EXCLUSIVE SWITCH GAMES !!! I'm ENOUGH to talk with STUBBORN people like you. Switch is BOTH Handheld and Console. You can take your Switch anywhere, Easy as 3DS. If you take Wii U on the go, you need a Big Capacity of Powerbank to keep your Wii U machine, Gamepad & LCD Monitor turning ON. Not very effective. Btw, have a nice day and you can trolling someone else with your Stubborness. Which suggests 3D Worlds is being ported to Switch. The thinking being they don't want levels that will be duplicated, even in reference, down the line. WE WANT SWITCH GAMES !!! EXCLUSIVE SWITCH GAMES !!!" If we want to Double Dip or Not is depend on us. Nobody forced you to Double Dip. To answer your complain, i might consider to buy Captain Toad ports since i have Never owned the Wii U version. "Still don't see why people complain so much about the existence of wii u ports." Because people follow the herd. And can't count. "there are more ports than original first party Switch games." There are more original first party games than first party ports. "it's because a majority of Nintendo published games are just Wii U ports." Wii U zealots are like flat earthers. They must REALLY want to forget the Wii U existed. That's 11 games including 2 Wii U ports and 1 simultaneous release. I know it's become accepted wisdom that Nintendo are putting out nothing but Wii U ports but it just isn't true. "Cry all you want, Nu-tendo is selling it as HOME CONSOLE and nothing else." The Earth is not flat. Stop lying. And when the "new console from Nintendo will come in some years" you'll be probably happy to get Mario Odyssey Complete edition, Xenoblade 2 GOTY EXTEND PREMIUM, Mario Tennis Aces ++ GOTY Gold version etc... Isn't it ??? Quit spreading lies and google Nintendo published Switch games. Probably licensing issues cause this change. Just wait till PS5 and XBox Whatever, and all the "4K Remaster" ports in the beginning.....then you all won't be complaining about the Switch's port problem. I’ll still get it anyways. I googled that for you and you can double check but I counted 11 non-ported Nintendo developed games for Wii U in the first year, and 4 non-ported Nintendo developed Switch games the first year. Which someone corrected me and told me to exclude Nintendo published. But there are only 13 Nintendo published games in the first year of the Switch, including games like Bayonetta 1 and 2 as separate games published and not developed by Nintendo. But those are ports. I was looking at NA release dates. Because of the lack of new Content. The Wii U had 11 non-ported Nintendo developed games in it's first year. The Switch had 4. Even i had two Wii U games that ported to Switch, i DIDN'T upset. Instead, i felt HAPPY because i can play them AGAIN on the go. What about my Wii U version ? They are part of my family members. @Cheez Hmm interesting numbers. I've never really looked into it before. Thanks for getting back to me with the info. Guess we'll see how the second year of Switch unfolds eh? It just only 4 and why do peoples get upset ? I think peoples have to take a Zen meditation to clear their minds and can accept the Ports existences, whether they want to buy or not. Were these levels ripped from Super Mario 3D World or were they brand new levels? @Anti-Matter Um...did you of all people just call @jimi stubborn? I have tried to explain things to you many times and you essentially ignore me. That's not stubborn? Did you felt upset when you know about Captain Toad ports ? Why did you upset ? If you think Switch will Lack of new games, no need to worry. Switch still has Tons of New games to play. Ports are just like Side dishes while waiting for Main course. The world will not ended just because Nintendo make another ports. Btw, ignoring you about what ? On the very first reveal, the introduction of the Switch to the world, the system is unsocked and played on the bus. The advertising slogan includes the phrase 'play anywhere'. It's not like they're even subtle about it. Anybody who claims they're marketing Switch solely as a home system is a liar, and we can all see that they're a liar. Not really happy with this. That being said, if the Odyssey levels are just reskinned versions of the SMW3D levels, fine. Whatever. Although, I gotta say: 3D World is a really underrated game. I mean, I loved SM64 and Mario Galaxy and I like how Nintendo separates 3D Mario and classic side-scrolling Mario. But while I liked Odyssey I don’t really get all the overwhelmingly positive press it gets. I mean, I’ve read a lot of articles claiming it to be one of, if not the best Mario game of all time. I know that is very subjective but while we’re on the subject, I always felt 3D World to be the far better game. I loved the way it jumped in difficulty when reaching the bonus worlds, not to mention Champion‘s Road. And despite all the (admittedly cool) fan service in Odyssey, I really missed an actual challenge. Plus, the amount of moons, to me, felt like it was just meant to keep you busy without offering any real motivation. Like the Korok Seeds in BotW. Anyway, sorry for rambling on so much. Just something I had to get out. I've just given you an accurate list. If it's wrong show where, flat earther. Denying reality is embarrassing. I am all for Wii U ports as I never owned one. Don't know why people are moaning. is anyone having problems to login the eshop? i get error codes. Because some peoples here keep begging for New games all the time. They got upset if Nintendo released Wii U ports, like they will not get New games for a moment. It's a portable fella. The Earth is round. It's amusing to think you need any more proof than the fact that it is portable. But then, denial of reality is the stock in trade of the Wii U zealot. "I already linked you to a Nintendo press release, calling it the fastest selling HOME CONSOLE. Case closed." Brilliant. We're past irony here. A press release. He keep persistent with his Little minded. Btw, are still mad with me ? @PALversusNTSC same here can't get on keep getting error code. Great to know that they removed the Super Mario 3D World Levels because it doesn't render the Wii U version of Captain Toad: Treasure Tracker useless. It said "Unable to connect the Server". i did a speedtest on the nintendo eshop server wich is 10mbps, that explains. guess the server is to crowded. i checked the internet, western europe has problems. belgium, netherlands, small part of germany even nothern france. prob, everyone wants to download captain toad lol. EDIT: its up and running again. Okay sure, but why replace old levels instead of just keeping the old ones and adding the new ones too? BTW GameXplain finished the game already and reported that the 4 new levels ONLY TAKE 5-7 minutes to complete. Meaning ALL the new content collectively totals 5-7 minutes. That warranted a new sticker on the front of the box. Wow. @marnelljm There were way more ports then first party Sony games for most of the PS4s life and while they might not have been full price, this game isn't either and most consumers don't care about the prices anyway. Most Wii U games have content to justify full price. @jimi It was sarcasm. That's why I said it in an article of another Wii U port. Yesterday it was "80% of first party games are just ports." That was a lie. Today, Post 19 "it's because a majority of Nintendo published games are just Wii U ports"
That's a lie. You then tried to shift the goalposts to developed games because you were wrong even though you accused me of lying. I've had a look at the Wiki page and can only guess that to get to 11 you're including Co-developed games, possibly a Gamecube port and/or separate Wii Sports games and/or DLC that got a standalone release while ignoring a Switch game that got a simultaneous release with the Wii U, and one developed by a wholly owned subsidiary and any ports with extra content. It's all obfuscation and misinformation. @Anti-Matter People get upset because the lack of new content. From what wikipedia seems to say in the first year of sales the Wii U had 11 new Nintendo developed titles and 1 port, wind wake, that was really a graphic and gameplay improvement. The Switch has had 4 new games. So comparing new releases for the systems it is disheartening to see so few new titles for the Switch. Maybe wait for the game to come out and actually confirm that the levels are gone before freaking out about it? @Joker13z Guess so. But looks like more ports for the time being. Even after the Smash Ultimate E3 release I read that many people say it is just Smash 4 with all the characters. Hopefully they actually improve it in some ways. And it looks like Prime 4 and Yoshi, some of Nintendo's only new and announced content, will be delayed until at least next year. Thankfully the few games they have released Odyssey and Xenoblade 2 have been exceptional. Being a Wii U and Switch owner though I'd rather have another 1 or 2 exceptional games than another 8 or 9 ports. I'd assume anyone that bought a Switch to play games. "It was never about your opinion." I never said it was. Its about physical fact. Its a portable and a home system. "I said for NINTENDO it's a HOME CONSOLE." ...but that is your dubious opinion. "I linked to their official press release, saying that it's their "best selling HOME CONSOLE"." You've got a press release, 1 bit of marketing. I've got their initial reveal, every advert they've ever done and their overarching marketing slogan. And physical fact.
" So what you would have to write now is "but but but that was Nintendo of America and not the real Nintendo", "but but but that was some intern who wrote that" or some other excuse like that"
I didn't say any of those things. I have no idea why you're trying to write my reply. That is very strange. "Stop talking about your personal opinions." You don't do irony do you? "Your personal opinion is not what Nintendo is saying"
Seriously, irony. Look it up. "Which is okay, you can also think that the 3DS is Nintendo's home console." Never said that. Why do you keep making up things I said? "I'm deeply sorry that you can't accept that you were wrong and I was right." You flat Earthers are brilliant. There's one other way I'd like to see the Switch version vary from the Wii U one - the uncharacteristic lack of multiple save files. It's usually a Nintendo first party staple, at least three save files, but the original version drops that entirely. It's an odd choice particularly for a game as short and simple as it was. I like to start a replay on the next file because I prefer to at least have it feel like I'm making progress again. Grabbing the transparent gems feels more hollow than getting them again in a new run through. Yeah, I know you can switch to another user but I just prefer having all the playthroughs ready to select in the same spot. and it's also a bit less likely I'll jump into multiple Switch files if it's largely the same game, since it will already be essentially a repeat visit. In Captain Toad post-credits scene, the game was framed as a Super Mario 3D World prequel. They'll probably remove it or switch it with a SMO-themed one, so removing the SM3DW levels makes sense too. Never assume. Especially never assume you speak for anyone else. Those levels will be sold as DLC. it would be better for nintendo to focus on new titles. people start complaining about their lazyness and easy money policy. its always great to bring out older games people might have missed, but they should realease them between new title releases. i still hope for these ports. alot more telltale games. the bundles they sold on xbox live or psn would be a dream. very good games. @LegendOfPokemon totally agree. MK8D might be the exception. Plus the added dynamic of being able to store two items was a cool at. DKTF- well, I got it b/c it was so hard on the Wii U. Wanted to play in chill mode. While that's cool and all, they should have added something else. Even some mini games or extra levels. Captain Toad was cool, but not cool enough for just four new levels. Oh well. a shame if we can't access these levels in the future. @Anti-Matter OK. Don't worry. I think I (slightly) overreacted. Btw I am NOT against ports. There just seems tk be a lot recently. I am saying this because my first console was the Wii and when I moved onto Wii U, I don't remember any Wii ports. look at what sony got in its first year. god of war definitive edition even the first 3 where redone. alot of indie games instead of new titles. the switch isn't so different from the competition. new titles takes time to develop, these titles are here to keep the costumer amused so to say "hooked" to the system. the wii-u had great games, even though the console itself wasn't popular, i realy enjoyed it. but i totaly agree with most of you guys, nintendo could do more effort in these titles, make them more special. like in mario kart 8 deluxe, everything looked great, but the end credits looked rubbish, they just unpscaled mario kart and enabled more effects, they did not do much about the title to add something extra. then again it was enough for me. captain toad with the exact same levels is just lame. the most annoying thing about nintendo games are the prices, everything is expensive, even 8 year old ports wich you pay half the money on steam or psn, xbox live. and that in even lower quality. what is wrong with nintendo? @rockodoodle Yeah, MK8DX is probably the port with the most effort put into it (and the best-selling too)! @MasterJay thats exactly what I was going to say. For me I actually STARTED Toad before I got Mario World. I had unlocked one of the stages through gameplay, and then finally picked up Mario World and the rest were unlocked the next time I booted up my game. mario 3d world...that game was epic. i remembered i complained alot about the 2d/3d style, still gave it a change, and i must say its one of the best mario games to date. my 5 year old son and i had so much fun with it. @Yosheel I was thinking the same, this was announced ages ago. @gatorboi352 Yea, I'm okay with it. The WiiU is dying out and its games deserved to see a lot more fans. Now they get their time to shine. We'll I won't be double dipping but I'm not too bothered about how many games are being ported to Switch because I want the games to get the sales they deserve. 3 Nintendo systems one game. @gatorboi352 EVERY WiiU game should come to Switch - not enough people played them and if the game is good, then by all means bring it over. I am still excited to buy this, because I never got to play the Wii U version! While I am looking forward to this game, it's going to be wait for a sale before purchasing. There's so much competition when it comes to my time and video games. This is one of those games that I know I'll enjoy, but I can easily pass until a year or two later and get it on the cheap. @Joker13z that logic goes out the window when a lot of core Nintendo fans DID buy a WII U and they have to put up with port after port of what they already have. Its way too much and there hasn't been a true gamer's game released all year and won't be until Smash. @Anti-Matter , good one, that is the advantage of the switch, you would think that people would understand. @brutalpanda look, I don't have a wii u. I feel honored I can play the great games that was on that system to the switch. Plus I can play them whenever I go. That is the advantage. Gorgeous game! Switch players can enjoy it now! The Mario 3D World levels in Captain Toad are literally ripped right out of Mario 3D World, with negligible changes to account for the lack of jumping. Yeah, I don't care about them. At least the new Mario Odyssey levels are actually re-designed in the "Box Garden" style like the rest of the game. This needs to be in addition to.. not replaced, regardless or not if those levels were uninspired. That's an odd decision. Why would they remove content? I don't see why the Odyssey content couldn't have stood alongside it, even if the 3D World levels were kind of shoddily done. @ekwcll wasn't talking to you, I was talking to the guy who said he didn't understand why people are bothered by the ports. Obviously if you didn't invest in a Wii u you don't care. For all the core fans that did though they are getting shortchanged. A lot of Wii u owners went out and bought the Switch either on release day or first few months because again they are the core Nintendo fans who stuck around in dire times. So after seeing as year 2 exclusives are more than half ports is disappointing and there is no sign of them stopping using ports as filler games throughout the Switch's life. Also Nintendo knows its fans love to collect so they throw in a paltry addition to the game only on Switch, don't allow a Wii U download and price it for full price. This isn't the Master Chief Collection we're talking either and sometimes graphics are barely improved. Its one of the reasons I'm out of the loop until year 3 when we hopefully start seeing a bigger annual lineup. There won't be any excuse not to have more than 5 new games next year unless their handheld divisions really are working on a 3ds successor. All these ports making the jump fairly seamlessly to Switch just highlights to me how little Nintendo actually tried to make use of the dual screen hardware of the Wii U, sadly. Anyway, I'll just grab this on Wii U, seeing as it's the cheapest there. I still want it, as I have never played it. During the Wii U days I had a lot less money to work with, so I skipped it. Kinda bummed I will miss out on a few levels, but I will still pick it up. A little unfair to the people who bought it on Wii U and supported a console Nintendo didn't. I bought a switch to play switch games.. wondering what you bought yours for? Not true. The levels were available as a completion bonus (after Episode 3) to everyone. Having a SM3DW save file merely unlocks them immediately. @brutalpanda 13 million people bought a Wii U and about 19 million people own a Switch assuming everyone who owned a Wii U owns a Switch (doubt it) Captain Toad has a new audience of at least 6 million people and I believe the Wii U version sold less than a million anyway. @Burning_Spear Nintendo published more than 20 games new made in house games. Not what I call no support. Switch games. Of which there are loads and I have 40+. The 3D World levels are added back in as free DLC for cross-promotion purposes when 3D World eventually launches on Switch. If I'm wrong, y'all are welcome to ridicule me. I am a Wii U owner but I no longer have as much time as I would like to play games in the front the TV (80 hour a week job, 5 kids to look after). As such, I have many games in my back log that I will likely never to. I want EVERY good Wii U game ported to Switch. I bought Captain Toad on Wii U, I liked it but never managed to finish all the levels/challenges. If I had this game on Switch I could play it while travelling to/from work on the train. That appeals to me a lot and am happy to give Nintendo £35 to make it a reality. I really don't care. Captain Toad was already a very short game, but very pleasing, cute and fun. This is a nice port for those who didn't have the chance to play it on the Wii U.
Hurrah, new content...oh, but we removed some things. Oh Nintendo (shaking head)! @marnelljm The only problem is lack of choice. I for one prefer to have a choice between buying or not buying and to have a choice the ported games need to exist. Don't like? Don't buy it. I all for ports skipping the ones I don't care for but understanding that other might love those. "If you have a save file on your Wii U of Super Mario 3d World, a bonus option should show up for you on the main screen. This allows you to explore certain levels from Super Mario 3d World as Captain Toad!" Perhaps SM3DW is getting a surprise port to Switch, and thus the SM3DW levels will also unlock on Switch via the save file mechanic? Seems odd they didn't mention it at E3, if it's true, but perhaps they didn't want a Mario game (albeit a port) stealing spotlight... They also have SMO to push to new install base. Could be a nice surprise on the way...? You people are insane, & that's coming from me! Never got around to this so quite happy the port is coming! Gimme all the levels! Maybe the 3D World levels are still there but we're just waiting for the inevitable port of 3D World to arrive on Switch first so you can unlock them. I'm actually planning to just get the Wii U version at the time of Switch release. I never got it for the U, it's cheaper, and I'm tiring of the full-priced ports. I've played Skyward Sword and Twilight Princess but I haven't played "Skyward Princess". I will buy it. cuz really cute. This is the one Port from Wii u that makes me mad... They should add like a full book of new levels. Not just a few. We have 100% completed the Wii u version. This is a very bad value for owners of wii u version. First of all, as far as "too many ports" complaints go, while I agree the ports are somewhat out of hand, it's important to realize not that many people owned a Wii U. Sure, it's a snub to Wii U owners such as myself who may feel the need to double dip but aside from that, Nintendo is simply trying to give more people a chance to play their games. As for this piece of news, I really enjoyed the game, but maybe not enough to buy it again. The new levels may be incentive to go again, and I suspect that they're going to port Mario 3D World to Switch at some point anyway. The 3D World stages may already be included in the data and just need the save file to unlock. Getting into the habit of leaving content out from what should be a complete, definitive edition of a game is a dangerous habit to get into and punishes a consumer who wants to archive the games they love. While I don't really care that much about these levels, I'm still hoping the web will give big N all the crap they need for this decision. People that have a WiiU feel robbed and those that didn't own it are happy. Captain Toad was one of the last Wii U games I completed. Got back to it last year after having finished BotW on Switch. The only thing annoying about the Wii U ports is that they only port the Wii U games I already have on Wii U. Bring on Paper Mario and Tokyo Mirage.